Coat of blue and green striped silk taffeta and satin; fold-back standing collar; cut-away from hem; waistcoat of silk faille with Roman-like arch embroidered showing a country scene; wing collar. On this waistcoat are delicately embroidered arches and rows of pillars in the style of ancient Rome. During the latter half of the 18th century, under the influence of neoclassicism, ancient Roman and Gothic ruins and remains were frequently adopted as motifs in paintings, garden fixtures, and such. At the end of the 1780s, just before the French Revolution, coats and figures that were decorated by spectacular embroidery disappeared, while striped patterns came into fashion. Waistcoats had a lapelled collar and their length became extremely short. 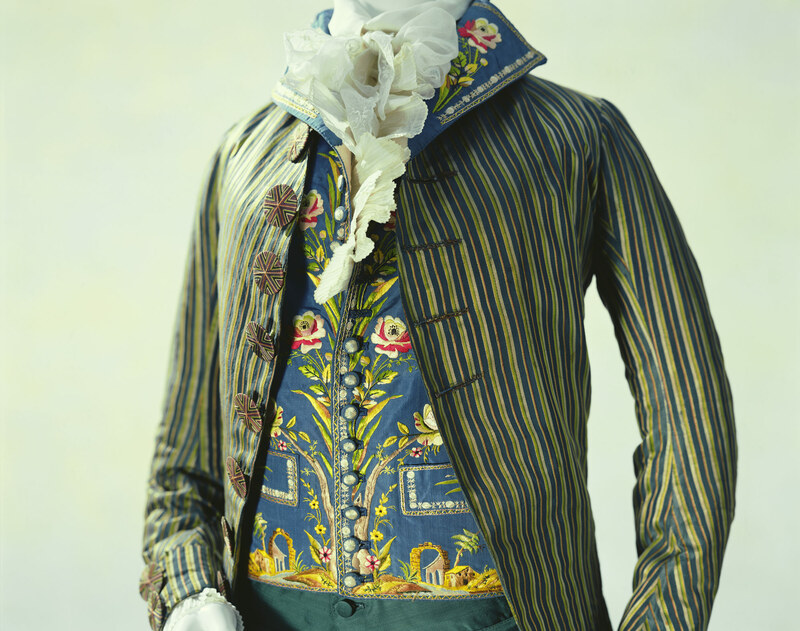 From the end of the 1780s to the first half of the 1800s, while coats were being simplified, waistcoats were adopting the showier tendencies of men's fashion.